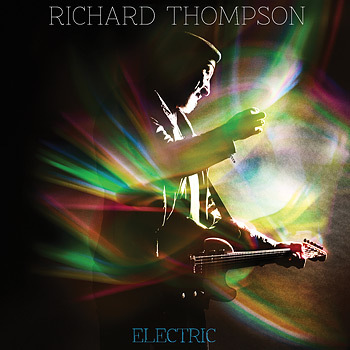 Two factors make it likely that Richard Thompson's current tour will deliver some of the best live shows of his career. (That's saying something since Thompson is widely acclaimed as one of the best guitarists and one of the best songwriters of all time.) First, he rarely gives an unsatisfying show but it unquestionably helps to be promoting an excellent album. His new release Electric just happens to be his best studio work since Mock Tudor back in 1999. (Note that I'm not including his theater piece Cabaret Of Souls or his brilliant film score for Grizzly Man.) He played seven of eleven tracks off the album and didn't even get around to the quiet highlight "The Snow Goose." The second factor is his current lineup. Both the album and tour are centered around a power trio, with Thompson on both electric and acoustic guitar, Taras Prodaniuk on bass and Michael Jerome on drums. Now Thompson always tours with musicians of the highest caliber; they have been bands in every sense of the word. But it's no criticism to say they've often been in support of Thompson, that Thompson's brilliant guitar playing was always the focus while the rest of the band stayed in the background. Not so at Joe's Pub on Tuesday, February 5, the day his new album hit stores. Thompson and Prodaniuk and Jerome were constantly pushing each other forward on song after song, trading licks, playfully interacting, brilliantly one-upping each other in service of the song and the music. From the opener "Stuck On The Treadmill" to the fiery closer "Tear-Stained Letter," their interplay was a marvel. It's no surprise that Thompson wows. His gift is not the technical brilliance displayed on each and every solo but the ease with which he delivers it. Thompson's playing is never showboating for its own sake because he is so fluid and masterful. It's not an ego-trip when he makes it look so dead simple. More importantly, the guitar solos are always searching, probing and emotionally direct; they're not fireworks (or, rather, not just fireworks) but illuminating musical passages directly related to the songs, to the angry, beaten down workingman of "Stuck On The Treadmill," the defeatist moan of "Can't Win" or on a lighter note the dirty old bugger of album opener "Stony Ground." Still, Thompson's usual excellence was goaded on by his fellow musicians. Jerome's inventive, complex and intelligent drumming was a marvel to behold, from that coruscating "Can't Win" (one of those mind-blowing live numbers that builds and builds and leaves an audience breathless by the end) to his subtle work on "Al Bowlly's In Heaven" and new standout "Good Things Happen To Bad People," another barn-burner. The nimble Prodaniuk on bass kept the heartbeat steady throughout, whether facing off with Thompson, offering a deftly delivered cushion for the others to launch off from or pulling out a killer falsetto that had me looking around for female backup singers the first time he revealed it. His hands swooped and fluttered over his bass and his dry asides fit in perfectly with Thompson's sense of humor. As audience members fruitlessly shouted out requests, they one-upped each other verbally, telling fans a certain song had been performed during the first set (there was only one that night) or would be done at the after party and so on. Clearly, the same energy was at work in the studio. Electric, produced by Buddy Miller, revolves around this power trio (though others join in at times). Nothing on the album will surprise or shock fans other than its quality. The usual black humor shoots through tales of frustrated dreams, small town romances gone bad and on the rare occasion a moment of grace. There's no tune about drunkards (another Thompson mainstay) but otherwise Thompson is working his usual patch of ground. What's remarkable is how rich it feels after so many albums and so many years of recording, how easily so many of the new tunes fit alongside his best. "Salford Sunday" is set in a dreary town where regret over the lost chance of a Saturday night is ruining the last day off and surely setting the tone for the rest of the week. "Sally B" is a playful romp, in which the erudite Thompson happily avers, "Who needs books when you've got them looks, Sally B?" On "Another Small Thing In Her Favour," Thompson shows a husband watching his wife head out the door for good in a gem of bittersweet regret. ("Still, she kissed me once more/ As she gently slammed the door/ That's Another Small Thing In Her Favour.") "Good Things Happen To Bad People" is a lock to be a concert favorite for years to come, thanks to its launching pad of a melody that set the trio soaring and offered a moment of rare optimism as Thompson says good things happen to bad people "but only -- but only -- for a while!" Hey, a fellow can dream. The album closer, the sweet and gentle "Saving The Good Stuff For You" brings the album to a lovely end and did much the same for the show as it was the second to last number. You know it's a good album when a concert includes seven new songs and you wish he'd played more of them. You know it's a good show when your only complaint is that it ended. P.S. Well, there was one complaint. My guest and the woman on the other side of me were both demanding to hear "1952 Vincent Black Lightning," Thompson's show-stopper of a tune and an instant classic when it debuted. I understood, even as I suggested after more than 20 years of being performed at virtually every show, we could allow it to rest for a while. Then we'd look forward to it even more next time around, yes? No! They said. Well, this tour is focused on the trio and that's not the place for a solo acoustic number. Just as Springsteen rested "Rosalita" and Dylan presumably doesn't always play "LIke A Rolling Stone," I think this tour will see the brilliant "1952 Vincent Black Lightning" taking a breather. Don't worry; it'll be back. Thanks for reading. Michael Giltz is the cohost of Showbiz Sandbox, a weekly pop culture podcast that reveals the industry take on entertainment news of the day and features top journalists and opinion makers as guests. It's available for free on iTunes. Visit Michael Giltz at his website and his daily blog. Download his podcast of celebrity interviews and his radio show, also called Popsurfing and also available for free on iTunes. Link to him on Netflix and gain access to thousands of ratings and reviews. Note: Michael Giltz is provided with free tickets to concerts with the understanding that he will be writing a review. All shows are in New York City unless otherwise indicated.